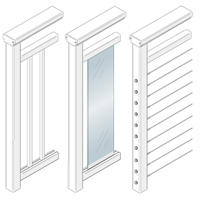 Posts are made from heavy duty 2-3/8" square tube extrusions and come pre-cut to meet minimum railing height standards for residential (minimum 36" & 38" high) or commercial (minimum 42" high). Special heavy duty posts are available for commercial (42") railings. See post options and mounting options, below. For all railings except for surface mounted commercial (42") railings. 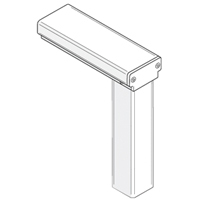 Square posts can be fascia mounted, fascia bracket mounted, surface mounted, or stanchion mounted. 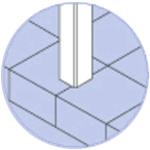 Feeney also offers a 45° corner post which allows single post construction at 45° corners. 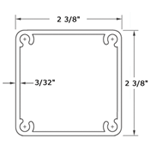 As with the square posts above, these extrusions come pre-cut and pre-drilled (except when used on stairs and ramps). For all railings except for commercial (42") railings. They can be either surface mounted using a pre-attached standard 45° profile base plate, fascia mounted, or stanchion mounted. Corner posts do not use a fascia bracket; custom welded angles are used for the stand-off in this application. 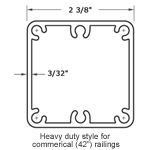 Special heavy duty posts are available for surface mounted commercial (42") railings. Posts come pre-drilled for cables when using horizontal cable infill (except stair and ramp posts which must be field-drilled). 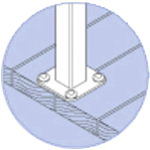 Heavy duty posts may be surface, fascia, fascia bracket or stanchion mounted. For commercial installations, Feeney offers a heavy duty 45° corner post which allows single post construction at 45° corners. 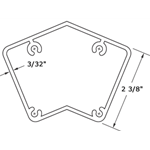 As with the square posts above, these extrusions come pre-cut and pre-drilled (except when used on stairs and ramps). 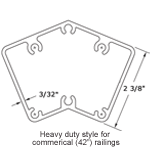 For side mounting to fascia boards, joists or walls. Fascia Mount posts come with pre-drilled bolt holes. Number of holes may vary upon application. Post can also be mounted to concrete or steel. 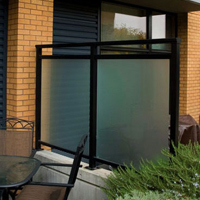 For top mounting to deck, patio or stair tread surfaces. 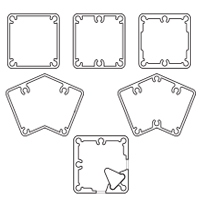 (5" square base plates come pre-attached). Note: Base plate can also be mounted to concrete or steel. 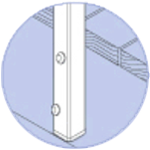 For side mounting to fascia or rim joists when decking or nosing trim extends beyond the edge of the fascia board. 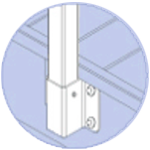 Posts are attached using metal brackets that have a 1-1/4" stand-off. 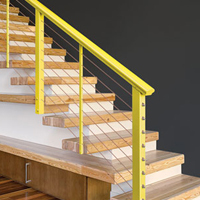 Railing may require a bottom Foot Rail when using this mounting method. Note: Bracket can also be mounted to concrete or steel. For mounting with stone or tile covered concrete slabs or on roof decks where penetration of waterproof roofing membranes must be minimized. Short stanchions are attached to the structural members prior to pouring the slave or laying the roof membrane. Railing posts are then sleeved over the protruding stanchion ends and secured with screws. Stanchions are available in steel, aluminum, or stainless steel. Typically 12" tall but can be custom sized and supplied with or without base plates. Note: Stanchions can also be mounted to concrete or steel.